An economical synthetic sheet rubber blend, based on SBR rubber compound. Mainly used in low-pressure applications where no oil, chemical or solvent resistance is required. 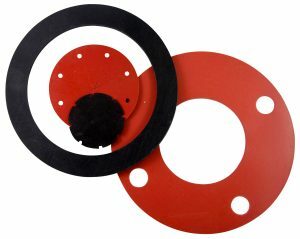 This rubber is ideal for seals, gaskets and other sheet applications where a recognizable red color is required. Redco RSP80™ is the workhorse flange-gasket for general service, industrial & water piping. Finish: Plain or Fabric Texture both sides. Uses: Gaskets, shims, spacers, etc. Redco™ SBR GP60, GP80 is a commercial grade of synthetic rubber for general industrial applications, gaskets, belt skirting and wear pads. SBR represents more than half of the synthetic rubber produced in the world. Its goal is to mimic natural rubber, but is entirely derived from synthetic oils. SBR Contains up to 23% Styrene and is a co-polymer of styrene and butadiene. Although its properties are similar to natural rubber, it excels as a low-cost abrasion material for general industrial applications. Upgrade to: Redco Safeguard™ or Redco NEOP60 Premium. Uses: Belt skirting, wear bars, impact pads, pulley-lagging, scraper blades, etc. Redco™ NEO-GP60 is a polychloroprene blend with good aging and resistance to abrasion and flex cracking. Formulated as an excellent general industrial material vs. cost, it is our most popular industrial grade. Polychloroprene (most commonly recognized by the trade-name Neoprene™) is one of the most commonly used rubber materials. It offers the most balanced set of properties and the additional ability to resist oils. It is critical to confirm product specifications as there are a wide range of grades available in Neoprene™. Available Thicknesses: 1/16” through 1” thick. Redco™ EPDM-GP60 is an excellent formulation for outdoor and higher temperature applications where a good blend of properties is required. Widely used in outdoor industrial and construction applications when exposure to UV and Weatherability is a concern. EPDM is a thermo-polymer of Ethylene-Propylene-Diene. Color: Black, White is available. Upgrade to: Redco™ EPDM CG60 or Redco™ P60 Premium. Uses: Seals, weatherstrip, gaskets, etc. Redco™ NBR-GP60 is an economical synthetic nitrile copolymer blend, modified with acrylonitrile content to increase its resistance to oils, fuels and to improve its physical properties. Advantages: Economical range of properties balanced with additional oil resistance. Limitation: Limited mechanical and chemical resistance. Upgrade to: Premium Redco™ NBR P60 or commercial Redco™ NBR CG60. Uses: Industrial parts, gaskets, bench-top liners, etc. Redco™ SBR GPCi60 Packing is an economical, general purpose grade of SBR sheet, with the addition of reinforcing fabric layers, to improve deformation, improve dimensional stability and reduce tearing and cutting in demanding applications. Containing 1 to 4 plies of polyester fabric textile. Available Thicknesses: 1/16”, 1/8”, 3/16” and 1/4” thick. Uses: Packing, aprons, spray-skirts, etc. Redco™ NEO GPCi70 is a general-purpose neoprene rubber reinforced with cloth fabric. This grade possesses a range of desirable properties and the fabric insert layer improves service life where cutting and tearing is a concern. Available Thicknesses: 1/16” through 1/4” thick.